Chocolate is a physical representation of love. To me, anyway. If you had to describe love as a physical thing or object, how would you describe it? What food or object would you relate love to? Chocolate is that expression of love for me. That is why I created A Box of Love. It is the ultimate expression of love in something physical and inanimate. It began as wanting to just do a range of rainbow chocolates. At that time in my life though I was undergoing a transformation in my thinking and realising that we are all creatures of love and we all want and need love for ourselves and for others. We are all love. Yet so many of us don’t realise it. I had been trying to help a terminally ill friend love herself more and so I had questioned how to do this as I wasn’t feeling very successful with it. I ended up realising we needed to just Be Love. At the same time as I began designing my box of rainbow chocolates this feeling of Universal Love was flowing through my soul and being and I wanted to embody this love in this chocolate box I was creating. 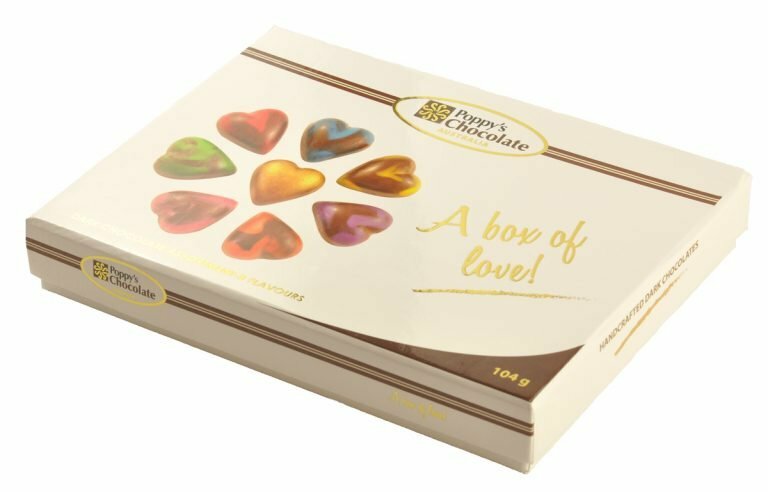 As I drew the box at my kitchen table and madly coloured in my drawings of chocolates with pencils and crayons, I knew it had to be called A Box of Love! The love begins with the package, a beautiful box that makes you feel there is something special inside. The photos and embossed gold make you feel rich, even though you may not be financially rich. The box is a pleasure to hold with a smooth hard case and the photos make you excited to see what’s inside. Then you open the box. The smell pops out at you. Wow! Chocolate smells so amazing. I want people to smell the chocolate and have the reaction they have when they walk into our factory. Did you know that just the smell of chocolate can make you happy? The vision inside is a sight for sore eyes. Each chocolate a heart. Heart shaped chocolates are, by far, the most popular moulded shape. People love love. 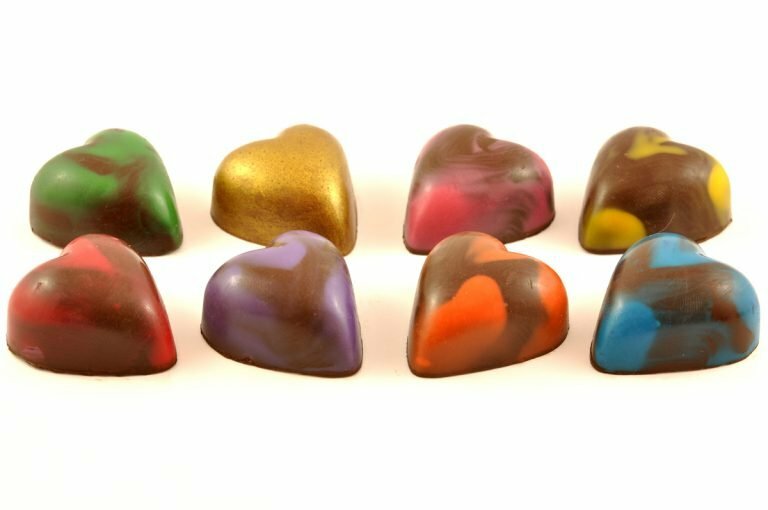 7 heart chocolates arranged in the shape of a rainbow, each heart lightly hand decorated with one colour of the rainbow. Red and yellow and pink and green, orange and purple and blue. (Yes, I know technically pink is not a rainbow colour but I decided the song version of the rainbow was much more fun and aesthetic.) 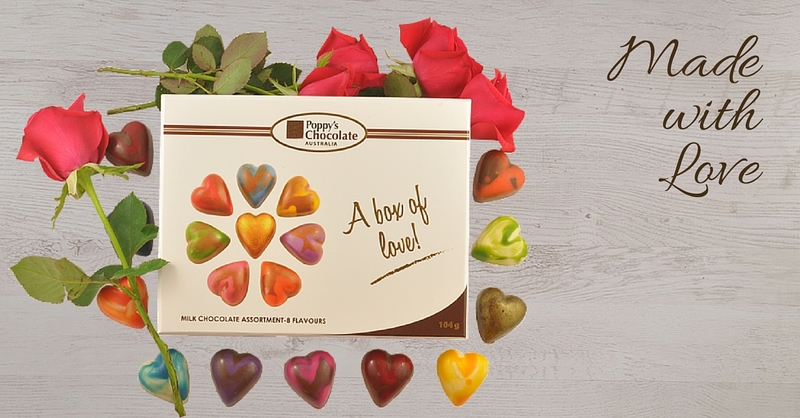 The ultimate prize is a pot of gold at the end of the rainbow and so A Box of Love also has a Gold chocolate, a heart of gold at the end of the rainbow at the centre of the base of the rainbow. Can you feel the love?! Already we feel the love looking at this beautiful arrangement of enticing chocolates and we haven’t even eaten them yet. The flavours are flavours of love also. Strawberry, lime, butterscotch banana, blood orange, raspberry, cappuccino, passionfruit and caramel. Each made with no artificial flavours, real fruit in the fruit flavoured chocolates. Strawberry tarts, key lime pie, Sticky date pudding with butterscotch sauce, banana custard, Orange flambe, raspberry jam drops, cappuccino (a special drink we tend to have only with friends), the passionfruit icing on a vanilla slice and caramel slices. Each small bite, small chocolate, represents a small taste of a huge range of delectable sweets to me (I am after all a major sweet tooth – not just a chocoholic). I wanted to capture those tastes in a nutshell, or in a chocolate shell as the case may be. We don’t have to eat 8 desserts and put on stacks of weight. We just enjoy and indulge in 8 chocolates, feeling the love as we let each chocolate melt on our tongue. And even when they are all gone and just a distant memory, we get to keep the box and use it for small keepsakes or even as an earring and jewellery box. The love lives on. I want people to be able to give a box of chocolates that really portrays meaning. That when they give it to someone, they know, and the other person knows, that there was thought and love put into this box. It’s not just a box of ordinary chocolates in an ordinary box picked up from the supermarket or servo. This box really, truly does mean and convey love. I also wanted the box to be something anyone would even buy for themselves. To give themselves a physical gift of the love they feel for their soul because it is important to love ourselves first before we can really feel true love for others. And that, my friends, is why I am passionate about chocolate. No other food can so universally convey this love. Keep an eye out for our next blog post, a photo journal of us developing A Box of Love.